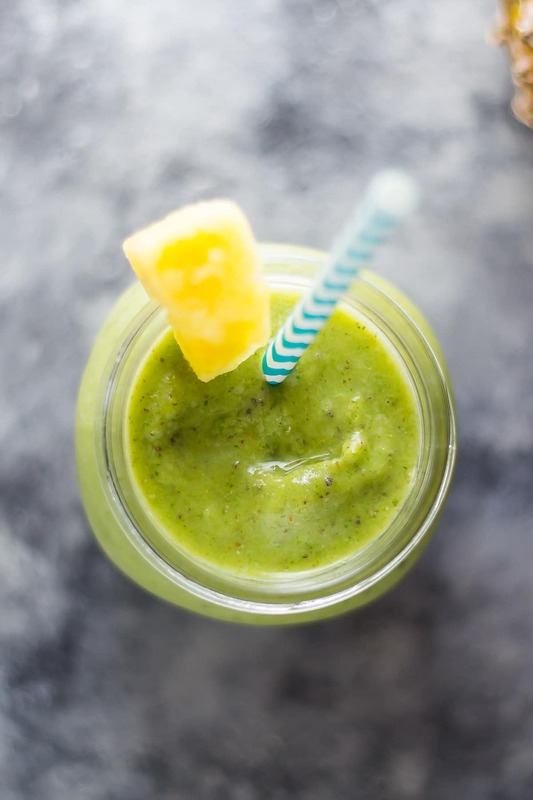 This anti-inflammatory turmeric smoothie has a taste of the tropics with pineapple, and is packed full of anti-inflammatory promoting ingredients. Banana free, no added sugar, and vegan. Today is pretty much smoothie-palooza. I am sharing my FIVE favorite healthy, sugar free, banana-free, anti-oxidant packed smoothie recipes with you, and I’m even showing you how to make them ahead of time! I love love love my smoothies, but realized that I was adding a ton of sugar to them by using juice as a liquid. So over the past few months, I’ve been on a mission to create some seriously delicious smoothie recipes that are naturally sweetened from the fruit, rather than using juice. Also, you may notice they are all banana free. I am a weirdo banana-hating nutcase. I can’t even stand the smell of them. Sorry banana-lovers! 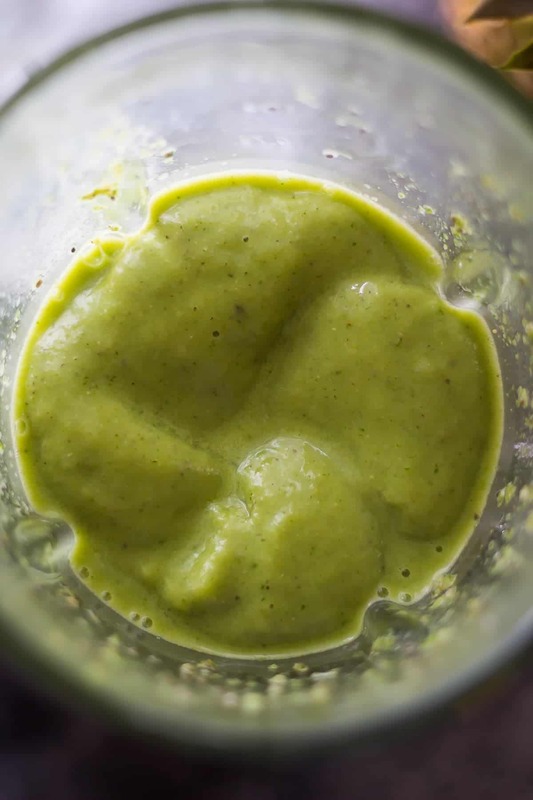 The first recipe I want to share with you is this anti-inflammatory turmeric smoothie. 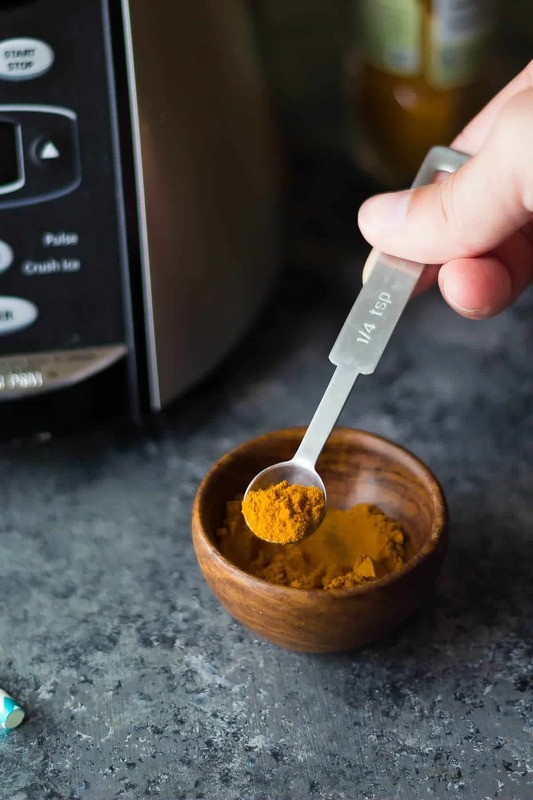 Turmeric is the new wonder-child of the health world, in case you haven’t heard. It has been shown to have anti-inflammatory properties, which is great news for anyone suffering from arthritis or Crohn’s, or anyone who is recovering from surgery. In order to activate the turmeric, I added a pinch of pepper, but I promise you can’t taste it! 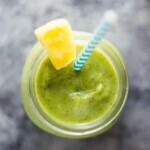 In addition, kale and pineapple both have anti-inflammatory properties. So basically this smoothie is an anti-inflammatory powerhouse. This anti-inflammatory turmeric smoothie is tropical and sweet but not too sweet. You totally can’t taste the kale, the turmeric or the pepper. You’re going to love it! So many healthy ingredients packed into one drink. Thirsty for more sugar free smoothie recipes? and don’t forget to check out this post to see how to make them all ahead! You may also like this Iced Matcha Latte and this Apple Cider Vinegar Drink! 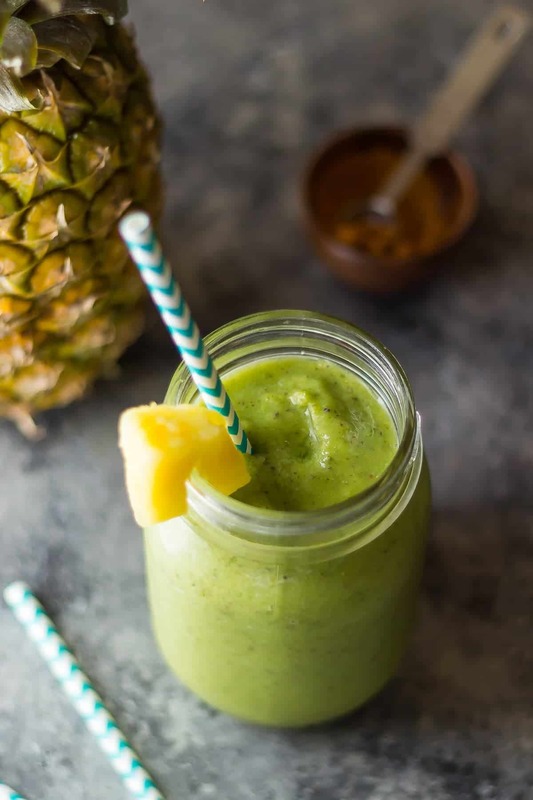 This anti-inflammatory turmeric smoothie has a taste of the tropics with pineapple, and is packed full of anti-inflammatory promoting ingredients. 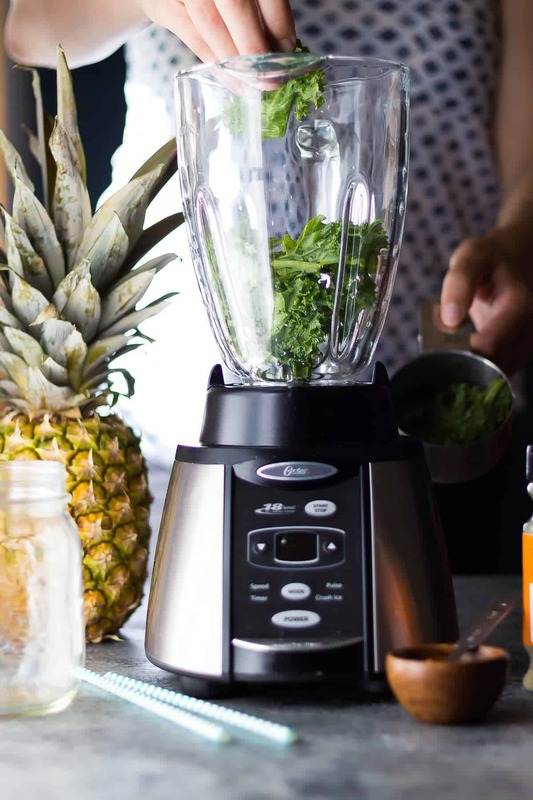 Add the pineapple chunks and blend again until completely smooth. Finally a smoothie with no banana, bless you! Thank you for sharing much appreciated! LOL! Glad I’m not alone! I would love to have this smoothie……unfortunately I can no longer have kale due to being on thyroxine. I can have spinach so can add that instead but wondering if there are other anti inflammatory ingredients that I could add. Hi,my name Karin and my skin is burning and feet.Don’t you have a recipe to detox my body ,like a smoothie ?, thanks. Hi Karin, I think I’d ask a doctor about that, or maybe a nutritionist? Hi Alex! I haven’t tried but I don’t see why not? Recipe title also says blueberries? Just checking…. Huh, that’s so weird. Updated, thanks for the heads up, Olivia! This has been my evening post walk dinner for the past 2 weeks. My roommate liked it so much that he bought us a Vitamix (something I have wanted for YEARS) so I’ll keep making them. I am nurtarian/vegan so I don’t do all of your recipes (although I have altered a few with varied success) but every one I have tried (and not altered) I have LOVED! Thanks so much for all you do! Hi Ayomide, I would check with your doctor…I have absolutely no idea! This is lovey, thanks for posting! I used coconut milk and yogurt as its all i had and added a tsp of chopped fresh ginger. Yum yum! Hi Holly, I’m so glad you liked it! I love the idea of coconut milk, I bet it was so creamy! And ginger is has great anti-inflammatory properties, great choice! I just made this and it’s wonderful! Thanks for sharing! Hi Denise , I really joy your blog and the breakfast smoothie in a jar is genius. What size jar do you recommend?